Artaxerxes II as he appears in his tomb at Persepolis, Iran. Artaxerxes II Mnemon /ˌɑːrtəˈzɜːrksiːz/ (Old Persian: , meaning "whose reign is through truth") was king of Persia from 404 BC until his death in 358 BC. He was a son of Darius II and Parysatis. Darius II died in 404 BC, just before the final victory of the Egyptian general, Amyrtaeus, over the Persians in Egypt. His successor was his eldest son Arsames who was crowned as Artaxerxes II in Pasargadae. He later received the title of Mnemon from the Greeks who found his memory to be exceptional. Even before his coronation, Artaxerxes was facing threats to his rule from his younger brother, Cyrus the Younger. By the time of Darius II’s death, Cyrus had already been successful in defeating the Syrians and Cilicians and was commanding a large army made up of his initial supporters plus those who had joined him in Phrygia and beyond. Upon hearing of his father’s death, Cyrus the Younger declared his claim to the throne, based on the argument that he was born to Darius and Parysatis after Darius had ascended to the throne, while Artaxerxes was born prior to Darius II gaining the throne . Artaxerxes became involved in a war with Persia's erstwhile allies, the Spartans, who, under Agesilaus II, invaded Asia Minor. In order to redirect the Spartans' attention to Greek affairs, Artaxerxes subsidized their enemies: in particular the Athenians, Thebans and Corinthians. These subsidies helped to engage the Spartans in what would become known as the Corinthian War. In 386 BC, Artaxerxes II betrayed his allies and came to an arrangement with Sparta, and in the Treaty of Antalcidas he forced his erstwhile allies to come to terms. This treaty restored control of the Greek cities of Ionia and Aeolis on the Anatolian coast to the Persians, while giving Sparta dominance on the Greek mainland. In 385 BC he campaigned against the Cadusians. Although successful against the Greeks, Artaxerxes had more trouble with the Egyptians, who had successfully revolted against him at the beginning of his reign. An attempt to reconquer Egypt in 373 BC was completely unsuccessful, but in his waning years the Persians did manage to defeat a joint Egyptian–Spartan effort to conquer Phoenicia. He quashed the Revolt of the Satraps in 372–362 BC. He is reported to have had a number of wives. His main wife was Stateira, until she was poisoned by Artaxerxes' mother Parysatis in about 400 BC. Another chief wife was a Greek woman of Phocaea named Aspasia (not the same as the concubine of Pericles). Artaxerxes II is said to have more than 115 sons from 350 wives. Much of Artaxerxes' wealth was spent on building projects. 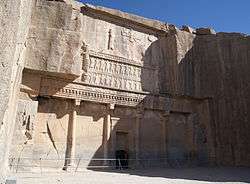 He restored the palace of Darius I at Susa, and also the fortifications; including a strong redoubt at the south-east corner of the enclosure and gave Ecbatana a new apadana and sculptures. It has been suggested that this man was the Ahasuerus mentioned in the Book of Esther. Plutarch in his Lives (AD 75) records alternative names Oarses and Arsicas for Artaxerxes II Mnemon given by Deinon (c. 360–340 BC) and Ctesias (Artexerxes II's physician) respectively. These derive from the Persian name Khshayarsha as do "Ahasuerus" ("Xerxes") and the hypocoristicon "Arshu" for Artaxerxes II found on a contemporary inscription (LBAT 162). These sources thus arguably identify Ahasuerus as Artaxerxes II in light of the names used in the Hebrew and Greek sources and accords with the contextual information from Pseudo-Hecataeus and Berossus as well as agreeing with Al-Tabari and Masudi's placement of events. The 13th century Syriac historian Bar-Hebraeus in his Chronography, also identifies Ahasuerus as Artaxerxes II citing the sixth century AD historian John of Ephesus. Zakarid-Mkhargrzeli, a noble family prominent in medieval Armenia and Georgia, claimed to be descended from Artaxerxes II – on the basis of his being nicknamed the "Longarmed", which was also the meaning of their own name. While authenticity of this pedigree is uncertain, it testifies to this king's long renown. ↑ R. Schmitt. "ARTAXERXES". Encyclopædia Iranica. 15 December 1986. Retrieved 12 March 2012. ↑ "The Achaemenid Empire". Retrieved 2015-06-21. ↑ "Achaemenid Royal Inscriptions: A2Sa". www.livius.org. Retrieved 2015-06-21. 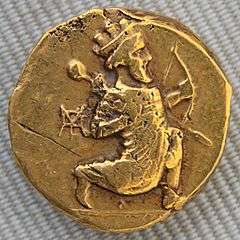 Wikimedia Commons has media related to Artaxerxes II. Inscriptions of Artaxerxes II in transcribed Persian and in English translation.